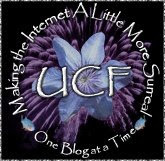 Polybloggimous: Another Link On The UCF Hairball. Today, I had lunch with Ilya! Yay! Here's a picture. Noooo. Ilya's not intertoob-phobic. The waitress must have been drunk. -We had minor difficulty meeting up since it's hard to find someone when you're standing almost a block away from each other, but we got over that. 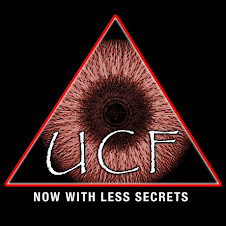 And if my email serves me right, I may be seeing our Secret Scientist tomorrow. I feel so special! Woo hoo! A Nathan/Ilya meat-up! Too cool. This has to be the first time an overseas UCFer has met a mainland UCFer in person, anywhere around the world! Congrats, you two! Tom, I think you're behind on the news. Ilya is no longer an ex-pat...he's a re-pat. And he would now appear to be the geographically nearest UCFer of the bunch...we're just a few rivers apart. Well Tom is spending all his time and money on his homewrecking... er, home renovation. Meat, meet and beer. And work is not involved. Now there needs to be Super Uno with strange phrases. After those couple of beers, not much of work was involved for the rest of the day either... Reminds me of good ol' England lunches... We should do this often! I got home and all I had the energy for was a nap! I know Ilya is NOW a Jersey Boy, but still, he WAS an overseas UCFer, and it was, after all, the first meat-up between an ex-overseas UCFer who isn't an overseas UCFer any more (duh, that's what ex- means, Tom) and a mainland UCFer who has always been a mainland UCFer. Woohoo! The hairball grows - I hope no one steps on it on the carpet, that'd be gross. I haven't met Ilya in ages. I am jealous, why you ask? Chicago doesn't do good Corned Beef sandwiches. The Ruebens here are always subpar. Konstantin misses good corned beef more than he misses Ilya. (Good luck getting Ilya to Fed-Ex some to you now! For a moment, Nathan, I thought you meant Ilya repatriated back to Rostov-Don. Whoopsie, that would be the first! All well that ends well, though (even if the gardens in Garden State are no comparison to English landscaping). Nathan, can I ask - is the Groucho Marx look intended or accidental? I wouldn't want to question your originality, but you're getting awfully close to a little repatriation of your own. You don't expect me to diligently read your archives for breakfast, do you? Anyway, pray tell, who is it that's going to repatriate me? He must be suicidal. You're not completely caught up with my archives?! By no means should you read them over breakfast. Put them off til later in the day when you're fully awake. It'd be a shame to miss something because you're insufficiently caffeinated. Out here in the wild west, I've had a corned *buffalo* sandwich (not a Reuben yet, but I'm considering it). It was really good.